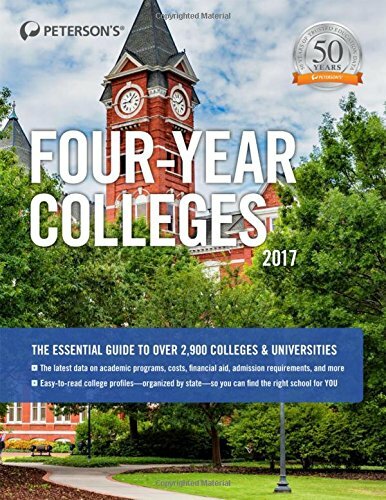 Peterson’s Four-Year Colleges 2017 is a valuable resource that includes information on every accredited four-year undergraduate institution in the U.S. and Canada (and many international schools)-more than 2,600 institutions in all. It also includes detailed two-page descriptions written by admissions personnel for over 200 colleges and universities. College-bound students and their parents can access details including campus setting, enrollment, academic programs, entrance difficulty, expenses, student-faculty ratio, application deadline, and contact information, as well as the most frequently chosen baccalaureate fields. Special section called “The Advice Center” provides insider info on specialized college options-Honors Programs and Colleges, Online Learning, Women’s Colleges, Public vs. Private.